Over the past few months, First Lady Michelle Obama has criss-crossed America to toast artists, congratulate students, and complain about her terrible, terrible life. Even though she resides in the top .001% of wealth, power and celebrity, Ms. Obama will never let us forget the pain of growing up in a middle-class, two-parent household and receiving one of the finest educations the world can offer. Having thoroughly depressed the U.S. with her tales of personal woe, FLOTUS took her act abroad, getting feted by the rich and powerful in London. While touring Old Blighty, she visited the Mulberry School for Girls which is located in a low-income, primarily Muslim neighborhood called Tower Hamlets. She inspired the student body the only way she knew how — grievance. Let’s face it — all of our stories are her stories. The classic narcissist needs to lug around a mirror so he can gaze at his reflection. The Obamas are a superior breed who can look at any group of people and see only themselves. "We lived in a really small apartment. And my brother and I shared a bedroom that was divided in half by a wooden partition, giving us each our own little, tiny rooms that fit just a twin bed and a small desk…"
"Because our apartment was so small, there wasn’t much privacy. I can remember how hard it was to concentrate on my homework because someone was always talking or watching TV right next to you......."
"So we constantly felt the struggle to balance our family responsibilities and the schoolwork, the activities, and the goals that we had for ourselves...."
"But despite my efforts, there were still people in my life who told me that I was setting my sights too high; that a girl like me couldn’t get into an elite university. "And the fact that I was a girl and that I was black — well, that certainly didn’t help things, either. When I was growing up, there were very few black women at high levels in business, or politics, or science, on TV, so I didn’t have many professional role models to look up to." Surely no one has suffered quite like Michelle Obama has suffered. But what she failed to mention is the rather different world she inhabits compared to the girls at the Mulberry School. Before the speech, Poor Little Rich FLOTUS enjoyed tea with Prince Harry at Buckingham Palace and relaxed with the Prime Minister at 10 Downing Street. After leaving Tower Hamlets, she (and her girls and their grandmother) jetted to Milan — at taxpayer expense, of course. After meeting the Italian Prime Minister they viewed Leonardo Da Vinci’s Last Supper. 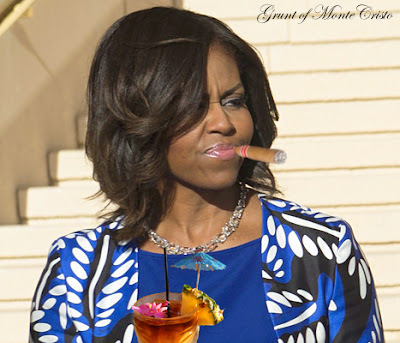 Then Michelle Obama went to the James Beard American Restaurant with acclaimed chefs Mario Batali and John Besh as her daughters shopped their way through Milan’s fashion district. Next, the First Entourage flies off to Venice for the Biennale contemporary art show.